Creative Sign Designs is a leader in interior and exterior signage solutions. With countless options available for signage in such a large and complex space, Creative’s team of experts guides the client step by step to achieve a cohesive and detailed plan. Achieving a professional and inviting environment is essential in indoor and outdoor corporate office signage, Creative can provide just that. 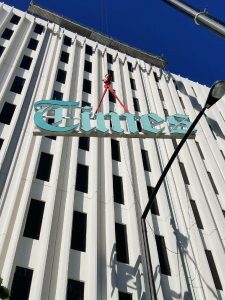 For the Tampa Bay Times downtown building, current codes would not allow for the same building placement of their updated exterior signage due to the lettering extending above the roof line. Creative Sign Designs was tasked with complying with the codes while updating the lettering to their current branding “Tampa Bay Times”. 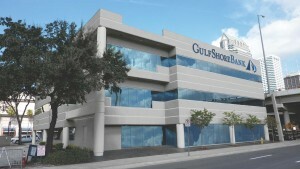 The corporate office headquarters for Gulfshore Bank in Tampa, Florida are adorned with custom signage from Creative Sign Designs. Learn about the turnkey sign package Creative provided for Gulfshore Bank. 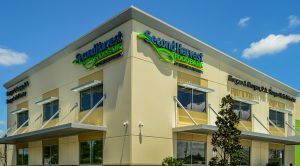 The Creative Sign Designs team was proud to partner with Second Harvest Food Bank of Central Florida for their interior, exterior and wayfinding signage needs at their corporate office locations in Orlando. The project included a donor recognition wall to highlight those who made the move to the new facility a reality. Creative provided a turnkey signage solution for Cott Beverage’s headquarters in Tampa, Florida. 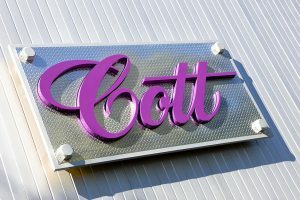 The project included custom channel letters filled with shredded soda cans to represent the brands Cott distributes. Creative Sign Designs has provided sign solutions for a variety of corporate brands. Contact us today for your signage needs!